Click poster to view at a larger size. 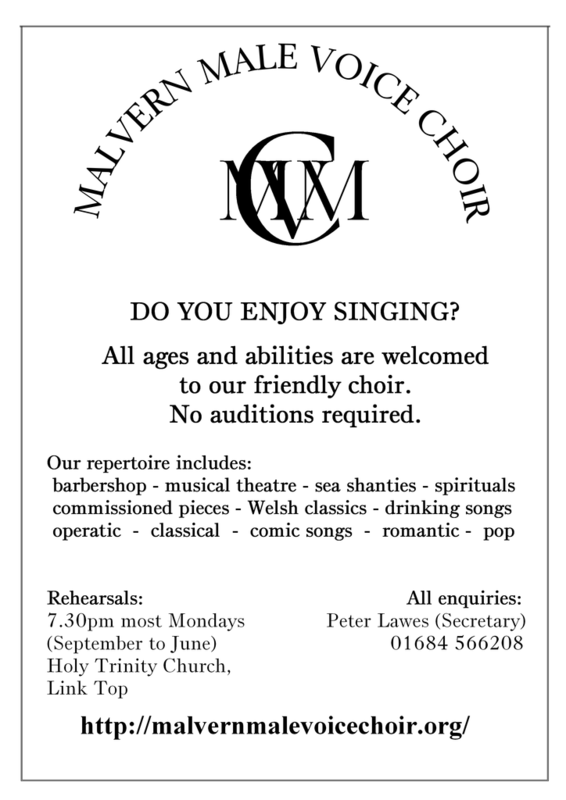 Malvern Male Voice Choir is a choir of about 30 men ranging in age from late teens to eighties. With a thriving, living tradition now over 90 years old, the Choir has been a long-standing force within Malvern’s musical history. The Choir rehearses on most Mondays from September to June, singing a vast spectrum of music ranging from hits of stage and screen to pop favourites of the sixties and beyond, classical masterpieces and part-songs, religious music including the occasional spiritual, songs from across the seas and across the border into Wales, some things humorous and, for four weeks of the year, a good dose of Christmas cheer. As it is one of the smaller male voice choirs in the two counties it has more easily and flexibly responded to the tastes of its members, developing a varied repertoire that is unique to itself. The Choir continues to grow solid a supporters’ base, performing to audiences on both sides of the Malvern Hills with at least three major concerts per year. It encourages performances with other local choirs and notable musicians, often in support of charitable causes. There are twice as many smaller performances, often by invitation to particular institutions and organizations in the locality who like to have local music to call upon. If you would like to know more about the Choir and how to book it to sing at an event that you are organizing, please contact the Secretary, Peter Lawes (tel 01684 566208). If you are interested in becoming a member you can contact the Secretary or one of the membership secretaries, Gordon Burrows (tel 01684 561474) and David Rank (tel 01684 563784).